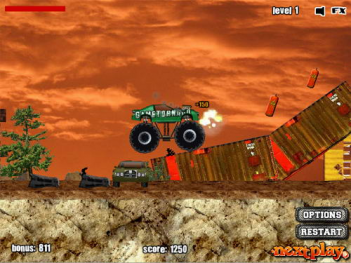 Great Monster Truck racing game Monster Truck Demolisher ¨C crazy offroad race course on earth! Pick your monster truck and demolish all the cars that are in your way! Get behind the wheel of this awesome Monster Trucks, crush everything in your way and complete all track levels without crashing. Earn points by smashing and driving over all the cars in the level. Use Arrow keys to drive your Monster Truck and Space bar to make truck jump.